Faustus is a Bay Area thrash metal band formed in the early 90's. Blending elements of traditional metal with thrash, and death metal, the band describes themselves as sounding like a cross between Iron Maiden and Judas Priest with dashes of Carcass and Anthrax. 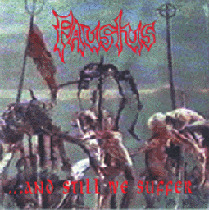 With "...And Still We Suffer" released in '92, Faustus is now currently working on their second major release after a 15 year hiatus. After all that time, their debut album still manages to generate interest. While some might term their style of thrash obsolete, Faustus continues to impress with their musical precision and talent.